It all starts with my friend, Frecy. She and I went to Journalism school; she with her long curly tresses, silver shoes, and mini skirt, I with my dark frizzy hair, black clothes, and dark eyeliner. She was consistently on the Dean’s List while I was being emo long before it was hip. We were not very close, although there was a time that we were, back when we staged the drama that I wrote. She played the title role, Violet. Fast forward to 15 years, I went to Singapore in August of 2017 in time for my birthday. Fres and I met again and when before I wasn’t sure if we were truly friends, this time I knew that we are. Years ago, Frecy went to Singapore to follow her heart. The relationship eventually ended but she remained grateful to the guy (and to this day, they are still friends), “If it weren’t for him, I wouldn’t have gone to Singapore, I wouldn’t be here today,” she said. I couldn’t help but admire her when she said that; such maturity that even I don’t possess. 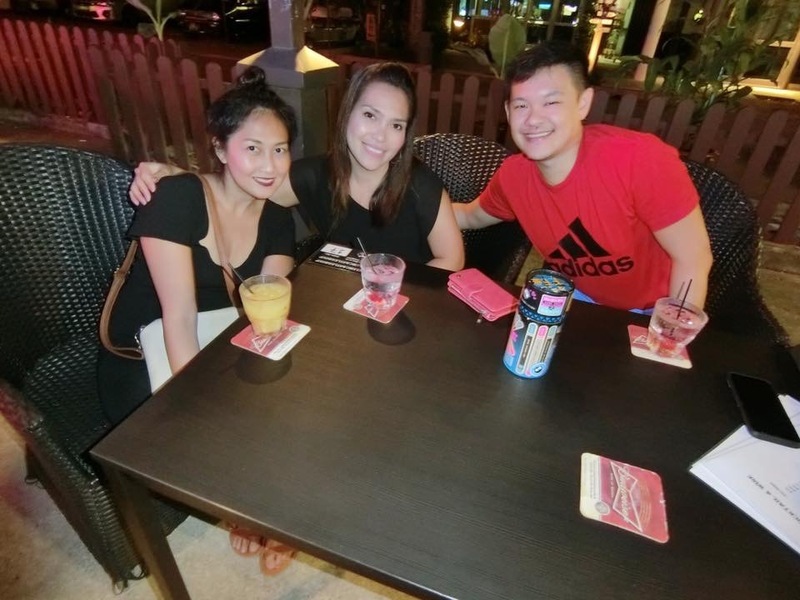 She is now married to a Singaporean and together they have two beautiful boys. They live in Bukit Panjang, a residential town in the West Region of Singapore. Fres offered that I stay with them during my Singapore visit. She let me use her kid’s playroom as my temporary bedroom. Even when Frecy and I are no strangers to each other, I still felt a little apprehensive about staying in her house knowing that her family would be there. I didn’t know her husband, I wasn’t sure if he would appreciate my presence. There’s also the thing about house rules and the whole concept of “pakikisama,” (fellow feeling). It’s not like staying in paid accommodation where I can go and leave as I please. There, I had to interact with the family, abide with their house rules, and ask permission when I need to use the loo or when I want to eat. But the real source of my anxiety is the ugly experience that I had when I couchsurfed in Vietnam. In my head, I was like, what if Fres and her husband, treat me the way the Vietnamese CS host did? Thankfully, Frecy and Edmund Lee are decent and nice people. They are not doing Couchsurfing, but if they were I would have left them a glowing review. Because of this family, my Singapore trip has been far more enriching. Because I stayed with a local I had access to the best spots that they frequent. I was able to eat the most recommended dish of my friends, the spicy crab at Kek Kopitiam, I ate the delectable buttered chicken masala in a well-known 24-hour restaurant, Al-Azhar, and I also visited my first Jollibee abroad at the Lucky Mall in Orchard area. Edmund said that he and his mother have a penchant for discovering cheap but amazing eats. I say they sure know where to find them because all of their food suggestions were delicious. Frecy is a new hire in their company, but she took a leave on a Friday to take me to Universal Studios Singapore. There is a special train that goes to Sentosa Island where USS is located. I looked at the window like a kid, relishing that sweet feeling of anticipation. USS was just as fun as the Universal Studios Japan, but because we didn’t have a special pass, Fres and I spent almost an hour waiting in the queue in every attraction. My most favorite ride had the longest waiting time, Terminator. It was amazing what the seats in this ride can do, they tilt, spin, vibrate, and the sound was so loud it was almost like it’s coming from the inside of my skull. The visuals in which we’re watching the Autobots and Decepticons fight are so vivid it was easy to buy to the illusion that we were part of the scenes. In those scenes in which there’s water, we were literally got sprayed on with mist. In the fire explosions scene, we were blasted with hot air. But it’s all safe, in fact, it’s one of the safest things you could do for that sweet adrenaline rush. Fres and I left the attraction giggling like school girls. On my last day in the Lion City, which happens to be my birthday, Fres took me to the places that would tell anyone, I was indeed in Singapore. We started the day in a mall to replace the broken screen of my phone. Then we went to this hip neighborhood called Haji Lane, lined with fashion boutiques, novelty shops, Middle Eastern cafes, and bar and restos. I don’t normally recommend buildings as tourist attractions, but Singapore has a lot of impressive buildings and infrastructures, it might be worth your time to check out some of them. I was particularly taken by The Gateway because from an angle it looks like a sheet of paper. They say you have never been to Singapore if you didn’t pose by the iconic Merlion statue at the Merlion Park. My friend made it a point to take me there. The amount of tourists is a bit overwhelming it was impossible to take a picture without them ruining the shot. Nonetheless, Fres knew how to wait for a good timing so I was able to have this photo without so many distractions (people). You can also see other famous Singaporean landmarks from this area like the Marina Bay Sands and the durian-inspired building, the Art Science Museum. One of my favorite spots in Singapore is the East Coast Park Castle beach. Dubbed as an urban getaway, East Coast Park is part of Singapore’s Parks and Nature Reserves. It’s a 15-km stretch of coastline, on a 185 hectares of land. Locals like to go here to have a picnic, do camping, cycling and inline skating, go fishing, waterski, etc. Fres and I rented bicycles and spent an hour or so cycling around the area. On the eve of my birthday, Fres and Edmund took me on a long drive to Malaysia to a spa that they frequent. It sounds funny but we did cross-border for the sole reason of getting a massage. The service there is a lot cheaper than in Singapore where everything is expensive. After a relaxing massage, we went to a rundown noodle place that serves appetizing noodle dishes, another discovery of Edmund. I wasn’t able to take photos given my semi-awake state at that time. 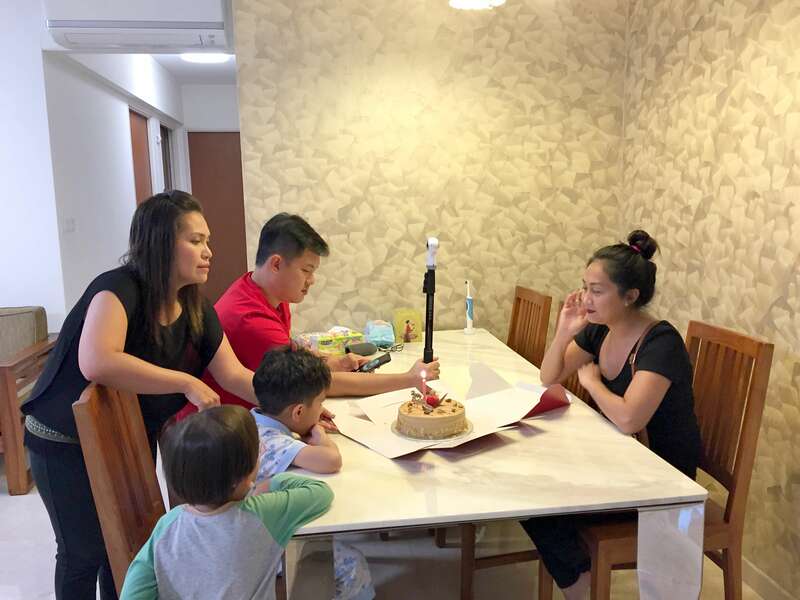 On the night before I left for Singapore, the Lee family surprised me with a birthday cake. The kids even sang me a birthday song in Chinese. Needless to say, I was very touched. I have been observing my birthday away from my folks for several years now and so it felt good to celebrate it in the company of a family. For the last hurrah of my Singapore trip, Edmund, Fres, and I went to Club Castle Group. It’s a bar far from the city that has videoke, drinks, and a humongous deck of cards. We had a few drinks, until I checked my flight schedule and realized that my flight is at around 5 in the morning, not 11 a.m. as I originally thought. And so we hurried home, I packed my stuff, and the couple drove me to the airport. I felt sad not being able to say goodbye to the kids whom I have grown quite fond of. I am also sad that I am leaving this lovely couple, especially my friend, Fres, who has been nothing but warm and generous to me during my stay. Fres is one if not the most brilliant student in our class and I’ve always known she will go places. She has the brain, the drive, and the courage and I am happy to see that she has reaped the fruits of her efforts. She is living a good life in Singapore, she has a beautiful family, a thriving career, and yet she remains to be humble despite her success. Because of her and her family, I was able to get a taste of local living in another country. It made my trip more meaningful not to mention memorable. At least now I know that staying with a local is actually a good experience if you are with the right people. To the Lee family, thank you so much for your warm welcome and generosity. You are the true reason I will never forget my Singapore trip. I haven’t been posting much lately because I have other priorities. I will try to make it up and post at least once every week (or every 2 weeks, depending on my mood). I’ll admit, Singapore has never really be on my list of must see places but you may have changed that. Singapore looks like an amazingly vibrant city I could see mysyelf visiting for sure! Wow, you must be really lucky to have a friend like Frecy. You guys seemed to look like just a sister, and I can really sense that you both are very close. Anyway, Singapore is really one my dream countries to visit. I love all what I have just read here from experiencing a local way of living, like enjoying the luscious food, seeing the intricate design of the buildings and I also look forward to experience Universal Studios. I hope I can visit Singapore soon If I get the chance. Thank you so much for sharing your lovely experience with us Marge. The home stay sounded so interesting. I have never thought that when thinking of Singapore. I will try this next time in Singapore! It’s always a wonderful experience to have a friend in a foreign land. Not only you get reconnected and enjoy your friendship but you also have the chance to personally sample local living. To celebrate an important occasion in life like your birthday with your visit in Singapore must be memorable and extra special. Singapore is an amazing city/state, it has done a great job of maximising its small area into a world-class destination of which you have the opportunity to savour. Singapore is so beautiful. I love the idea of “homestay” and glad you enjoyed the place with a friend. Singapore is also listed on my bucket list. 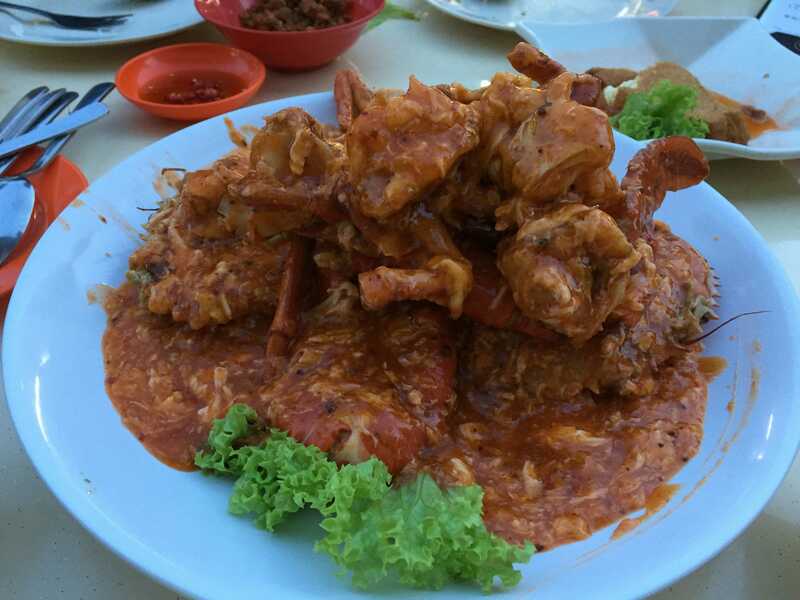 The spicy crab is mouthwatering. I have stayed with both friends and people I met on the road. So far, my experiences have been really wonderful and generally positive. I understand the feeling of seemingly less freedom when being hosted. It’s happened to me several times, but I learned to be resourceful of the limited freedom I had. Sometimes, it would turn out that the confines I saw made my experiences even more profound and enlightening. 🙂 Anyway, I suddenly missed Asia because of this post. Did you ever try set A in the local diners? I’ve never been to Singapore and it’s out of my bucketlist. I’ve always thought it’s too much of a city and too less of a cultural experience. Your story gave me a different perspective about it, and I love how art managed to seep through its city living image. You know what, I always think that if a Filipino will go to Singapore, chances are they have friends or relatives who are living there, and you get to explore the place with a local and save money too. haha. I have lots of friends in Singapore and I think I will have to see most of them when I go there. Anyway, i am stunned by your photo in Haji Lane. Seems like a cool place to see street art. And The Gateway too, at first look it looks like I’m seeing an illusion. Having a house to stay in wherever you go is both a blessing and a bane. Have faced this dilemma many times. It does have a comfort factor but lacks the independence of staying in a hotel. But of course, if the person with whom you are staying is close to you then there is not much issue. Nice to know that everything worked out really well in the end and you had a nice time in Singapore. Our own Singapore sojourn was a short one and we particularly liked Sentosa Island. BTW belated birthday wishes. This year, I aspire to take my family to Singapore. The place is indeed beautiful and seems to be rich in it’s offerings, particularly for kids. What a lovely story of your friend. And you also seem to have had a great time there. Will come back to you with more questions when I plan my trip. You definitely had an unforgettable experience, Marjorie! Exploring Singapore with a local seems like an ultimate experience. How many days would you recommend staying there to see all the highlights? It does make the place way more special and memorable being with locals. Happy to read your post reconnecting with an old friend. Si frecy yung most brilliant sa batch. Ako yung more brilliant, hindi nyo lang nahalata bihira kasi ako pumasok. I stayed with a local family in Singapore too the first time I visited there. Like you, I met my childhood friend who’s married with a Singaporean but they only had 1 kid that time.. now they have four hehe I agree that it’s great to stay with the right local people especially for food :p as you’ve experienced, you were able to visit the best local restaurants (i am not sure if you were able to learn some new dishes, i did) … i like the fact that i have an access to the kitchen when i stayed in my friend’s house, her mother-in-law is indonesian so we cooked indonesian dishes… i hope to go back to sg… ill try to visit the east coast park, of all the places you listed, that’s the one i missed. It’s really great to have friends in different places (literally and figuratively). It sure looks like you had a memorable time in SG. I love you Instagram photos. 🙂 You look good in all of them. Anyway, what place would you want to revisit in SG when you come back?